Colman's is one of the most recognised brands in the food industry. 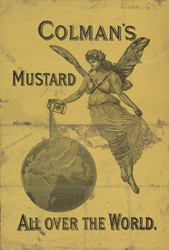 Jerimiah Colman, a miller of flour, started work on his recipe for mustard in 1804. Black and white mustard seeds were ground separately and then sifted to separate the husks and bran from the mustard flour. Now the company use brown instead of black mustard seeds. Colman's moved to the City of Norwich in 1854 and built a very large factory complex at Carrow. They also built houses for their employees near by. The Colman family's pioneering achievements in social welfare bacame part of Norwich's history. In 1857 a school was opened for the employees' children, while in 1864 the firm employed a nurse to help sick members of staff - a social revolution at the time.